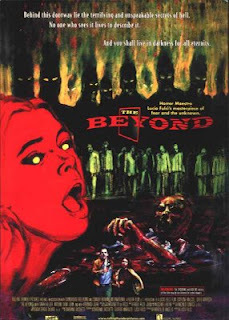 Widely seen as Lucio Fulci's horror masterpiece, The Beyond begins long ago- so long ago the video is sepia-toned- with a man named Schweick staying in a hotel in Lousiana, painting some weird painting. A mob of people storm the hotel and before you know it they murder him. And I mean, murder him. It's almost ridiculous. They beat him nearly to death with giant chains. Then nail him to the wall. Then dump acid all over him. Why didn't they then cremate the remains and then dump the ashes in the ocean and then blow up the ocean, just to make sure? Well, I guess they just aren't that mean. We then travel through time to the present day, and here we meet Liza, who has inherited this hotel. Having failed to settle into a comfortable career back in NYC, this hotel is basically her last chance, she tells us, regardless of the fact that she is young and healthy and could go work in an office or go back to school or anything really. But when life hands you old hotels, you turn them into renovated hotels and hopefully get rich. And if not, I guess you just give up because there's nothing you can do. One by one all the people she has helping her out start dying increasingly hideous deaths. One guy falls off the roof. The next guy has his face torn apart by a zombie. Another guy gets slowly eaten to death by tarantulas. I felt like there should have been a death a little less out there between the roof and the zombie, because the vast gulf of horror between "roof" and "zombie" is a little too much. You gotta do these things more gradually. In the meantime Liza meets the ruggedly handsome John, who is a doctor at the town hospital. Nothing really happens with them. He's just there to run around shooting the zombies that are destined to appear in a movie like this, since you know, Liza is a girl and also this is an Italian movie, so she is just going to be grabbing her head and shrieking once all hell breaks loose. His secondary function is to tell Liza over and over how crazy she is when she tries to tell him all the weird stuff that is happening. Italian guys in the 80s, those kooks. The Beyond has very little of what might be called a plot. 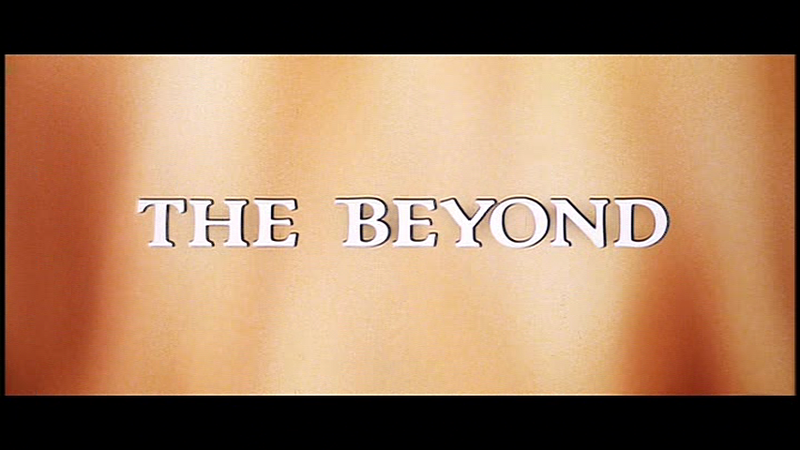 It's more of a bunch of special effect extravaganza death scenes linked with spooky haunted house stuff. What sets this film apart from, say, A Nightmare of Elm Street 3: The Dream Warriors, is that The Beyond is gorgeously shot. There are so many scenes where the composition of the screen is so striking you will never forget them, like the scene where Liza meets the creepy blind girl Emily and her dog for the first time. Another great thing about this movie is that from the minute bad things start happening until the end, it does not let up. There aren't really any jump scares or drawn out suspense scenes. The pacing is so quick that you have no time to breathe and it's like an hour long nightmare. I can't think of higher praise.